PENNYLANE PATCHWORK: What to do with an old quilt? Many years ago my sister returned from a holiday to country NSW with a present for me. 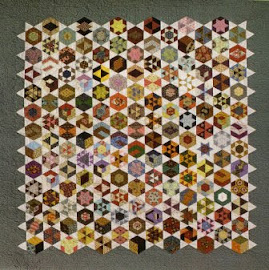 Knowing I was a quilter she couldn't walk past an old tatty quilt in a back room of an Antique shop. It was dirty and stained and torn but for twenty dollars she thought she would purchase it to for me just in case I saw some worth in it! Well I love this old quilt but what does one do with such a thing? It's 88" X 96" (225cm X 245 cm) and it's not hard to tell it is really old! I am guessing 150 years old. It is a beautifully handquilted wholecloth and the stitches are so small and neat. Can you see how many stitches to the inch? The design is 'Medallion-like' with three borders around a central rectangle. The design elements are lovely and though not complex are not simple either. A traditional feathered oval surrounds the central six petalled flower with 1/2" diagonal lines behind them. Any ideas on what I could do with this treasure of mine will be gratefully accepted! It would be great as the back to a couple body pillow covers. You could do something quilty for the front side and then this would be your great backing (washed and soaked in a vintage re-store soap of course). Hi Penny! I have only just found this post...I wouldn't do anything "crafty" with this lovely, lovely treasure, certainly not cut it up and re-use it, it really is too beautiful and precious. One school of quilt repair says any repair should be able to be undone...ie perhaps a careful repair of the rips by hand apliqueing a similar muslin on both sides to stabilise? A soak in the bath to remove the worst of the stains will bring it back to life...gentle squeeze to remove much of the water then spin in the machine - lay it out flat on a sheet (or a trampoline! )in the sun to dry. Good luck, whatever you chose to do or not do. Thanks for your idea's Kate. I agree this old treasure needs to be washed. I will have to wait for the perfect day to do this!